Inside Employment and Aging with a Disability, you'll learn about the Americans with Disabilities Act (ADA), the law that protects us from discrimination in the workplace, and the types of assistance available for people unemployed, but who don't want to be, like vocational rehabilitation (VR). Also, for people employed, you'll find tips on how to stay employed, such as the types of reasonable accommodations. Our website's section on other resources, which is a detailed list of other groups and agencies that serve and support people aging with a disability was recently updated. Updates included additional resources and better descriptions of these resources. We invite you to come check these out! Inside Getting Trustworthy Health Information from the Internet, you'll learn about the tips on conducting internet searches, how to tell if a website is one you can trust, and whether the information is up-to-date. 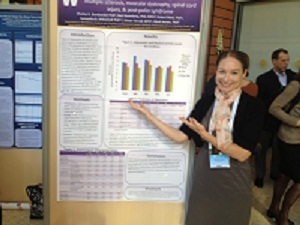 Dawn Ehde presented a poster looking at happiness at the American Congress of Rehabilitation Medicine (ACRM) annual scientific meeting. Dr. Ehde found people aging with a physical disability despite worsening physical function, higher levels of pain and fatigue rated their happiness about the same as people aging without a disability. Also, happiness ratings were higher in people who were 65 or older. Ivan Molton was part of special symposium at the Gerontological Society of America’s (GSA) Annual Scientific Meeting which brings together more than 4,000 professionals in the field of aging. This symposium chronicled the impact of people aging into or with a disability and the broader implications of this for health care policy and service delivery. Inside Sleep and Aging with a Disability, you'll learn about the types of sleep problems people aging with a disability suffer from, what's behind these problems, and what evidence-based treatments and therapies are available to reduce sleep problems. Come check out our new factsheet! We have a new factsheet! Inside Getting the Most Out of Health Care Visits, you will learn how to PACT: Prepare, Ask Questions, Create a Plan, and Take Away Materials. Come check out the new factsheet!